Ah yes, the po' boy... Up to this point, we've had some beignets, BBQ shrimp, gumbo, etouffee and crawfish pie. But we did not have any po' boys yet. 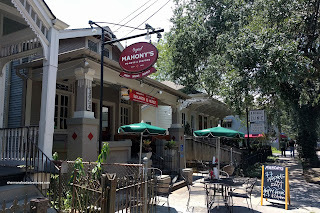 That was going to change when we took the St. Charles street car out to Mahony's in the Garden District. Not really on the beaten path nor is it usually regarded as the best (because Parkway has that distinction being the oldest and featured on Triple-D's). 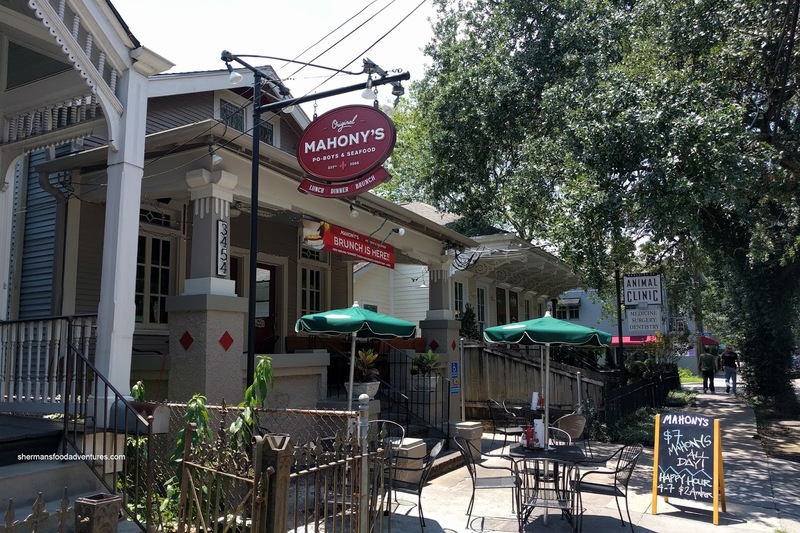 But according to some (including Mijune), it sports one of the best Po' Boys in town specifically The Peacemaker (with bacon and cheese). 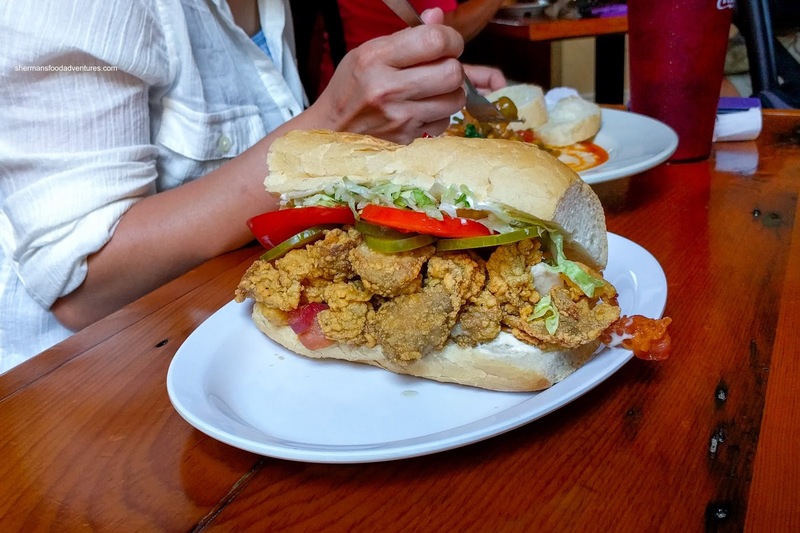 Behold, The Peacemaker stuffed with P&J fried oysters, cheese, bacon, lettuce, tomato, pickles and mayo. This was only the "regular" sized version! Imagine the large! It ate as good as it looked with large buttery oysters that were bursting with briny juices. They were lightly coated and fried where the outside was crispy but not heavy. Combine that with cheddar cheese and crispy bacon, how could one go wrong??? The fresh veggies kept things light while the pickles added some crunchy zing. We added drops of hot sauce to put it over the top. Only thing we would've liked to see was softer bread as everything fell out with each bite. We also got something that they are not known for in the Shrimp & Grits. You know what? It was pretty good despite that fact. 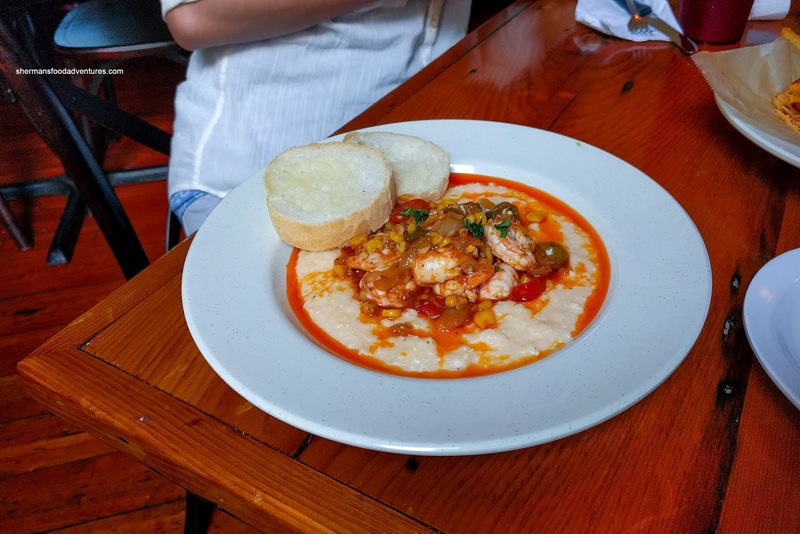 It featured fluffy grits that still retained texture while not being too runny. It was topped with meaty shrimp that were well-seasoned and naturally sweet and aromatic. The flavors were appealingly salty, buttery and slightly spicy with the brininess from the shrimp. However, the smaller pieces of shrimp were on the chewier side (the bigger ones were on point though). Our 3rd plate was the Loaded Fries topped with crawfish etouffee. 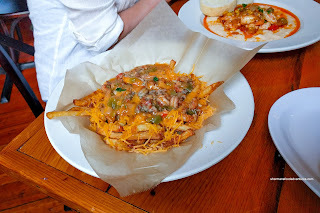 These well-salted and crispy fries were aggressively sauced with the etouffee and plenty of cheddar cheese. It was strangely sweet for some reason, but the saltiness of the fries did balance somewhat. Loved the briny murkiness of the crawfish as it added an Earthiness to the dish. We would've liked to see some more spice, but again, the hot sauce came to the rescue. 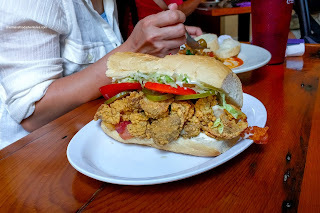 In the end, we found the food in general pretty solid and the po' boy to be on point. It was worth the trek out there.